Imagine that you've lived in the dark your whole life when one day the lights are suddenly turned on. Would it disturb you to see that the world is nothing like how you imagined it? That's the question put forth in Jack Karp's brilliant opening monologue to his original play Irreversible, presented at the 14th Street Y by The Red Fern Theatre Company. 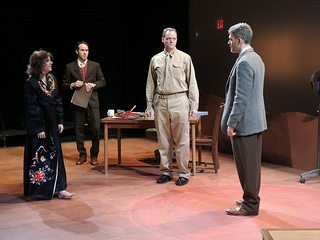 The play regards the Oppenheimer brothers as they race against time to unlock the secret to weaponizing atomic energy near the end of World War II. Robert Oppenheimer (Jordan Kaplan) pressures his team of scientists, including his younger brother Frank (Josh Doucette), to work to their absolute limit in order to finish work on the "Gadget" before Germany does the same thing. Being cooped up in a military base for so long begins to drive a wedge between Robert and his wife Kitty (Laura Pruden) and receiving telegrams from his former lover Jean Tatlock (Amelia Mathews) only drives it deeper. While Robert pushes his loved ones away, he too is pressured by military general Leslie Groves (Hugh Sinclair) to find the missing ingredient to the bomb's success. Seeds of doubt are also planted in Robert's head after a visit from scientist Dr. Niels Bohr (Dan Odell), who views the entire project with a wary eye. As the project nears its inevitable completion, Robert and Frank begin to take opposing views on the morality of what they have done. Irreversible is not a short play - a 10 minute intermission bringing the running time to two hours and twenty minutes - and some scenes are more engaging than others, but as a whole it's the slow burn that makes the story work. The scenes are broken up between conversations between two or more characters and Robert addressing his team of scientists, staged so that the audience stands in for the latter. 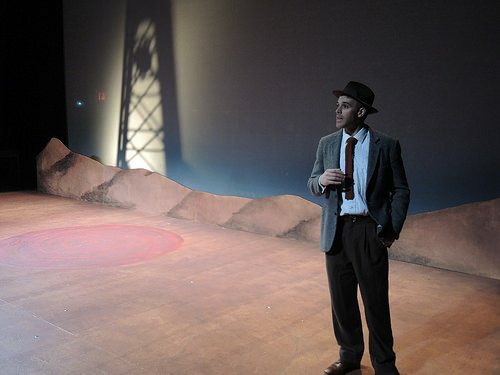 The most impressive effect, equally credited to both Karp's writing and director Melanie Moyer Williams's precise staging, occurs when three different scenes and conversations seem to be happening at the same time, with Robert Oppenheimer seemingly speaking with every other character at once about completely different topics, truly showcasing the amount of pressure he is under. It is difficult to single out any particular actor from this show, as its cast is one of the more impressive ensembles this reviewer has seen on a stage. Jordan Kaplan's Robert Oppenheimer is a terrifically flawed hero who is rarely without a cigarette to calm his nerves, and continues to stand tall and confident as his world bears down on him more and more. As brother Frank, Josh Doucette properly portrays the meeker sibling who eventually finds the strength to oppose the brother he idolizes. Unexpected comic relief can be found in Hugh Sinclair's General Leslie Groves, a serious man who can't help but find wonder in the possibilities of this new weapon. In her brief but impactful appearance, Amelia Mathews's tragic portrayal of Jean Tatlock creates a lasting impression and will make you miss her every time she leaves the stage. Thanks to a committed ensemble cast, sharp-eyed staging and thought-provoking writing, Jack Karp's Irreversible is one of those rare shows that can change the way you look at your world upon leaving the theater. You might even say it turns on the lights for you.